Proving once again they deserve the title "most metal of all living animals", Boa constrictors know when to stop squeezing around their prey — because they can feel their victim's heart stop. The constricting method of subduing prey is a relatively costly one in terms of energy, so it behooves snakes to know as soon as possible when to stop. As you can see in this brutal high-speed video, they expend a lot of energy in the attack, squeezing their prey to death — and up until now, we haven't understood how the Boa constrictors know when to let go. This new research has discovered that the snake can detect the heartbeat of its prey, and will only let go once the heartbeat stops. By using simulated hearts in rat cadavers, they were able to measure how the attacks happen, how long they last, and how forceful they are. The researchers found that as soon after the heart stopped, the snake let go — even in snakes that had never before captured live prey. 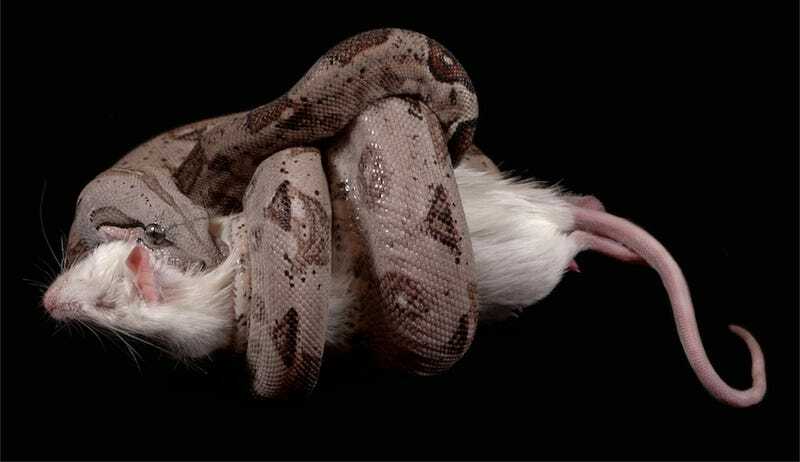 As an evolutionary trait, it's an admirable one because it allows the Boa to successfully hunt a variety of species, and be able to hang on long enough to kill all of them, but not so long as to waste any energy.